Ace Your FAA Sport Pilot Oral & Sport Pilot Practical Test — Guaranteed! You'll learn on-screen exactly what the FAA wants you to demonstrate to earn your Sport Pilot Rating. This course shows you a real-world Sport Pilot Practical Test including both the oral and flight portions. $1039 $499 ... 52% off! Airplane, Trike or Powered Parachute—this course is for you! 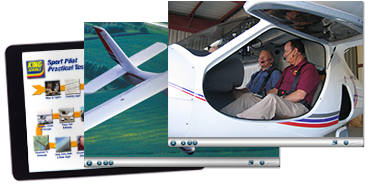 Although you'll see a model checkride conducted in a fixed-wing Light Sport Aircraft (LSA), this course will still apply to you even if you plan to take your flight test in a trike or a powered parachute. Your oral exam will cover the same topics and you will be expected to exhibit the same level of knowledge. And during the in-flight portion of your test you'll be required to demonstrate many of the same maneuvers. You'll find the KING Sport Pilot Practical Test Course invaluable preparation ... and no matter what kind of LSA you'll take your flight test in ... you'll be prepared and confident—guaranteed! Learn the maneuvers you need today! Go from handshake to handshake with an actual FAA Examiner. Covers all you need, from the beginning of your oral exam to successful completion of the flight test. Your pass is guaranteed! You'll learn from stunning in-flight footage and cockpit demonstrations of the maneuvers you need to know ... shot from three different camera angles for complete understanding. Filling the role of the Designated Examiner is Rusty Sachs, the Executive Director of the National Association of Flight Instructors (NAFI), a Master CFI and an FAA-designated pilot examiner. John King gives a model performance as the applicant. From the oral to each maneuver—you'll come away totally confident. You'll understand the questions and the tasks. Best of all, you'll be confident you'll ace your FAA Sport Pilot Practical Test because you've been through it all before. This course is designed to prepare you to take and pass the FAA sport pilot Practical Test (a.k.a. sport pilot Checkride). You have lifetime access to your Online sport pilot Practical Test Course. Remember, with the online media, the course is also automatically updated and will always be current. Consider getting your private pilot! Of course, King Schools will be there to help you achieve this goal with King Schools private pilot Courses. I feel you did a great job of putting the video together!! This was better than paying for a full mock-up check ride which would have cost me hundreds of dollars. Much more detailed and cost effective! Covered just about everything on practical test. This course is very valuable. Gives me more confidence on what to expect for the practical test. Nicely done! The information provided within this course removes the mystery of the checkride. It's especially helpful when questions that may be on the oral are incorporated. excellent visual presentation, very good explanations. Excellent website...easy to access and move around in it! Not as good as I hoped for. Very helpful to know what will happen before it happens! Excellent course to prepare me for check-ride and oral review. Glad I purchased this course from King. I thought that this was an outstanding program. I am presently a student Sport Pilot, have passed my FAA Written, and am working my way towards soloing. This is excellent prep for both the solo and the Check Ride. I highly recommend this to anyone pursuing their Sport Pilot Certificate. The combination of John King and Rusty Sachs (Executive DIrector of Nat Assoc of Flight Instructors) made for content that was easily understood and easily remembered. Mead C. Killion, Ph.D. Loved every minute of it !